Packed full of leeks, onions, and carrots, this sweet potato soup is enhanced by a whole variety of flavors from roasted garlic to cilantro to lime juice, curry powder, and jalapeno. 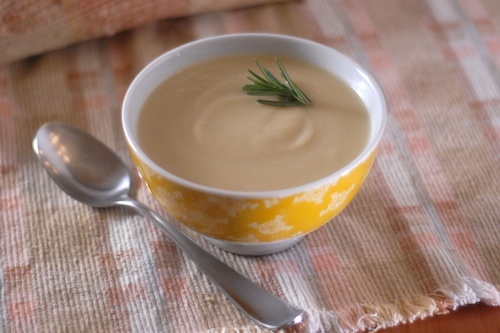 I discovered Susan Bradley’s Sweetpotato, Ginger, & Coconut Bisque on her inventive Luna Cafe blog and made a much lighter adaptation for our family. One part of her recipe she insists on is the four (count them) garnishes she recommends: toasted flaked coconut, chopped cilantro, cilantro lime oil, and sour cream. 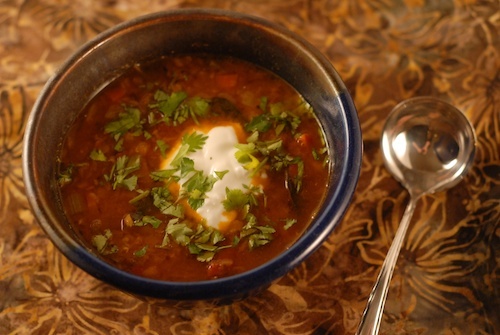 I kept three garnishes, skipping the sour cream— along with the butter, chicken stock, and cream– and made a vegan soup with clean vegetable and spice flavors. I used homemade vegetable stock, which combined with the other vegetable ingredients makes a very nutrient rich soup. The toasted flaked coconut is highly addictive and I’m surprised the package made it through my three test versions of this soup without being completely nibbled away. The flakes give the soup a little chewy/crunchy texture and a nice coconut flavor without adding a lot of fat. I put coconut milk on the table as a stir-in option. A spoonful melts easily while the soup is hot, and those who aren’t looking for the extra calories can skip it. 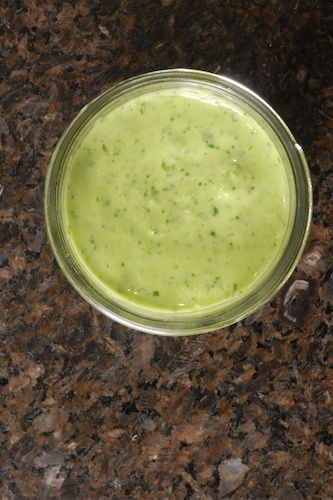 The cilantro lime garnish took but a minute or two in the food processor and made a very flavorful green sauce. This takes an hour of active prep time before starting the garnishes, more than I’d normally do for a weekday dinner. But with so many layers of flavor, it would be perfect for a weekend dinner or special occasion (in which case I’d add coconut milk during my prep). I’ve served it with just bread or with bread and the simplest salad I could make. Susan calls for roasting peeled, cubed sweet potatoes and a head of garlic in the oven. Recipes for roasting garlic often call for drizzling the garlic with olive oil, but that’s not necessary. The second (and third) times I made this soup I got inattentive and burned the sweet potatoes, which seemed to burn a little more easily than the garlic. So I cooked up some sweet potatoes in vegetable stock to replace them. That takes only 2o minutes instead of 45 for roasting, but is not quite as delicious. Blend the cooked sweet potatoes, roasted garlic, and stock. If you have a smaller blender, remove the sweet potatoes from the pot with a slotted spoon and blend them with just a small portion of the stock. 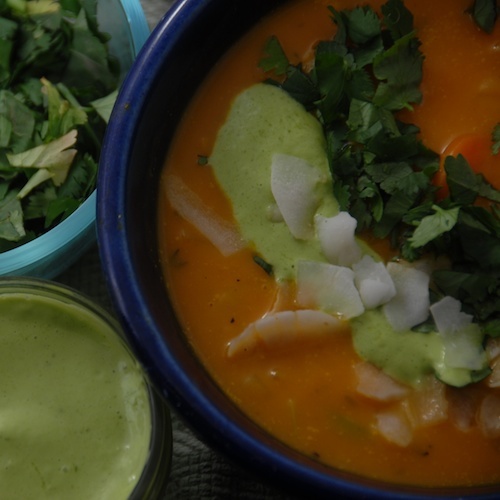 Packed full of leeks, onions, and carrots, this sweet potato soup is enhanced by a whole variety of flavors from roasted garlic to cilantro to lime juice, curry powder, and jalapeno. The garnishes make it extra special. Thanks to Luna Cafe for the idea. Cooking garlic and sweet potatoes. Cut top off head of garlic removing top of bulb and the tip of most of the cloves of garlic. Peel the sweet potatoes and cut into large chunks. Place cubed sweet potatoes and head of garlic on a baking sheet on greased parchment paper and roast in oven at 375 for 35-45 minutes, checking for doneness starting at 35 minutes. 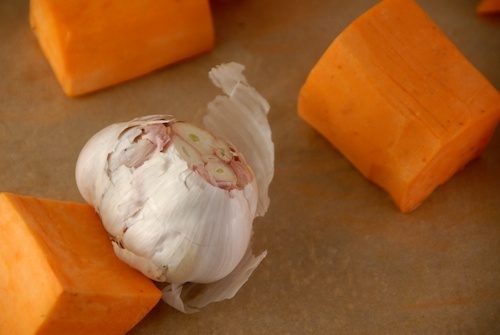 Remove from oven, let garlic cool, and squeeze the bulb to extract the softened garlic cloves. Add roasted garlic, cooked sweet potatoes, and some of the stock to your blender. If the stock is hot, be cautious. Your type of blender may require that you let it cool off some first. Blend until smooth. Peel and chop yellow onions. Trim, cut, wash and chop leek (see my post on how to clean leeks if you haven't done it before). Peel and mince ginger root. Cut jalapeno peppers in half, remove seeds. Mince. Add olive oil to large stockpot, heat. Fry ginger root for a couple of minutes in the olive oil. Add onions, carrots, and leeks. Fry until they have become soft but not brown. Add curry, thyme, and jalapeno to pot and stirfry for another couple of minutes. Add pureed sweet potato/garlic mixture and any remaining stock to the pot. Add desired quantity of coconut milk (more, less or none). Simmer for 15-20 minutes, adding lime juice, salt, and pepper to taste. Starting with homemade vegetable stock, which has some sodium naturally, I only needed to add 1 tsp. of salt. If you use store-bought stock, which can be salty, you may not need to add any salt at all. Directions using a Vitamix or other high powered blender: add all ingredients to blender, blend, beginning with low speed and gradually increasing speed to high, running at high until completely smooth. Directions using a food processor: Add scallions and cilantro to food processor, chop. While machine is running, drizzle olive oil in through the top. Stop the machine to scrape down occasionally as needed. Blend until smooth. Add lime juice, blend again briefly. Toast flaked coconut for a 2-3 minutes in a pan on the range on medium heat, stirring constantly until brown. Serve coconut milk, cilantro, toasted coconut, and cilantro lime garnish on the table, allowing diners to garnish their soup as they wish. 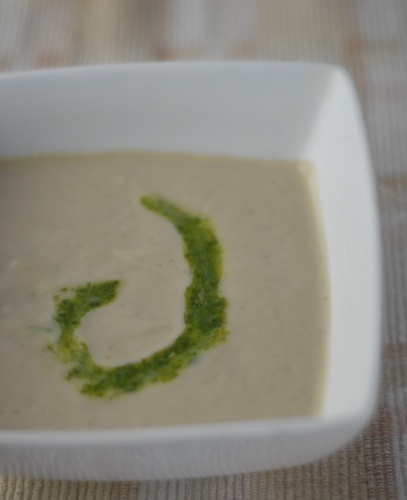 The coconut milk should be added to the soup first so it can be stirred in while the soup is still hot. Note: cook time will vary depending on which preparation method you choose. 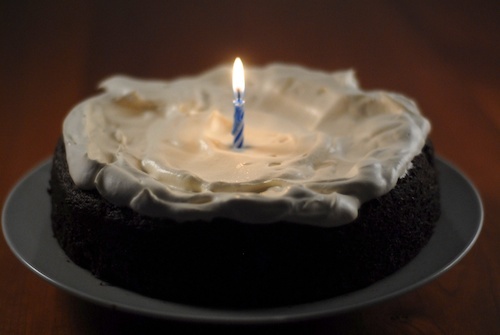 Happy 1st Blogiversary Fit and Fed! Fit and Fed just marked its one year anniversary! Here are a few of my favorite moments from the first year. I made your soup tonight, Mary. It was delicious! I used a small container of coconut milk to add some richness (probably I should worry about the fat, but I like coconut milk). I did roast the sweet potatoes, since I was doing the garlic anyway. You didn’t say when to put in the jalapenos, so I added them with the ginger at the beginning. I’m so glad you tried it, Beth, thanks so much for letting me know how you liked it! I’m glad roasting the sweet potatoes worked for you. I clarified the jalapeno in the directions, thanks. I love coconut milk, too, but I made it an add-in for flexibility. One person in our family is trying to lose weight and has asked me to cook especially light meals. Always a challenge to cook something that works for everyone! Mary, I made this soup for a dinner party and everyone loved it so much that they all asked for the recipe. I did roast the sweet potato and garlic. I added 1/2 cup of coconut milk at the end. I also used a stick blender to puree the soup. I did not use any onion, mostly because I don’t do well with onion and I felt the leek was sufficient. To make it simpler my garnishes were toasted coconut, cilantro & scallions. Accompaniments were pan-grilled sockeye salmon marinated in tamari, garlic, ginger, & sake, and rice balls with a miso, honey, sake dressing. Thank you for this wonderful soup recipe. Gena, you just made my day, I’m so cheered to hear about the success of this soup at your dinner party! Seems like the reader consensus is for roasting the sweet potatoes and for adding the coconut milk to the pot- both make sense. I’m glad the stick blender worked well for this. The rest of your menu sounds delicious, the salmon is classic and I’m sure I’d love the rice balls, too.